Recently, I released a statement about the many accusations directed towards me regarding my position on the Karmapa Controversy over the years. Since then, I have received a lot of feedback from devotees. One of the requests I have been receiving most often has been for me to reveal who the other person was that had been involved in the forging of Situ Rinpoche’s fake prediction letter. This information will not be disclosed. I will say that I feel certain that the person who offered their suggestions to Situ Rinpoche in this regard did not have any bad intentions. It is the habit of many old fashioned Tibetans to behave hypocritically. Of course, later, there were some other negative influences on Situ Rinpoche who helped to shape the outcome of the controversy, though by now I believe any sensible person should already know who these people are. In any case, the person who was alluded to in my recent statement was, at most, guilty of being old fashioned and had no intent on doing any harm to myself or the lineage. Another question I have been asked since the release of my last statement was why, “out of compassion”, did I give in so easily to the requests of Tulku Ugyen. What does that mean? Tulku Ugyen was my guru, from whom I received the entire Rinchen Terzod (The Treasury of the Nyingma Termas). He was over eighty years old at the time. He felt it was very important that I receive this transmission and he worked day and night passing it on to me. How could I disappoint him? As far as Ugyen Thinley is concerned, I understood from the beginning that it would not be fruitful to protest. China wanted to recognize Ugyen Thinley as a Karmapa and enthrone him in Tsurphu. Tsurphu is in China, not India. With China being as powerful as they are, I was paralyzed to stop it. Moreover, His Holiness Dalai Lama had already given his acknowledgment, and as everyone knows His Holiness Dalai Lama is one of the most powerful spiritual leaders in the world. So, though it was very bad for the Karma Kagyu tradition, my objection at that time would be akin to the barking of a dog. I felt that we should instead work hard to protect our precious lineage, and that this was the only solution at the time. I knew then that the majority of people wanted to believe in Ugyen Thinly as the Karmapa, for the very reasons mentioned above. 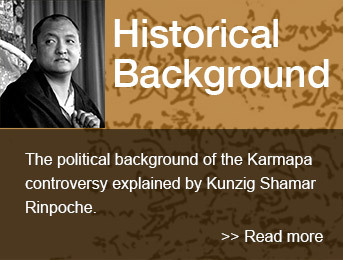 However, it was very important to enthrone the traditionally recognized Karmapa, so as to support the preservation of our unique Karma Kagyu lineage. I understood very well that what was good for the Karma Kagyu tradition would not be very good for me as an individual under these circumstances. Yet, I sacrificed myself for the greater good in order to protect the lineage. The reason I chose to sacrifice myself was that I had already by that time taken on the role of leadership, in accord with my position as the Shamarpa. How could I ignore something so important in order to save myself from any hardship? I took this responsibility seriously, as is my duty. I tried to be a bulldozer, in order to build up the strength of the genuine Karma Kagyu tradition. According to the power of my position and the wishes I had made, our achievements were great. The main reason for this is due to the genuine support of all the well-wishers for the Karmapa and His lineage. I am so grateful to these people who chose to support the truth in spite of their own disadvantages. It is for this reason as well that I went along with Tulku Ugyen’s requests at that time and then went on to fulfill my duty as the Shamarpa. There are so many monks, nuns and lay people who are suffering due to the damage done to our Karma Kagyu tradition. They all trust and rely on me as their only savior. If it were not for the suffering of these people and their undying trust in me to remedy the situation, I may have done things differently. However, how could I ignore them? Among the high levels of society to the normal civilians, the monks’ community and the general lay community, so many suffered from the damage done to our lineage, especially those in the administration of the late 16th Karmapa. This was evidenced in the recent letter sent to His Holiness Dalai Lama in May of 2011 from the monks of the Rumtek Dharma Chakra Centre in Sikkim. I hope this addition to my previous statement sheds some light onto the reasons behind my decisions made over the years and allows for more understanding of the circumstances that surrounded them.